It really doesn't have to be a terrifying experience. For some reason, most of us seem to think of "meeting the parents" as the scariest thing you have to do as an adult human. But it really doesn't have to be. It's rare for a family to set out to meet their child's partner with the intention of hating them. The most important thing is to just be yourself. Plus, once the first meeting it out of the way, it only gets easier. Try as hard as you can to relax, writer and relationship expert Sylvia Smith suggests. Obvs you're going to be super nervous but remember meeting your partner's family isn't going to be the Worst Thing Ever. "Their family wants to love you as much as your beau does, so help them fall for you by being your true self and treating them like real people—not just the dreaded in-laws," she says. Doesn't sound too hard, does it? JK. Here's how to make a good impression while still totally being yourself. "Your partner's told their family about you, so it’s only fair to even the playing field. Getting your bearings about who is at the dinner table will help you feel more at ease. Have them give you the lowdown on what to expect from their family before walking in," she says. Maybe ask your partner what the family vibe tends to be: loud or kind of reserved? Knowing this should "make you feel more comfortable when it comes to making conversation," says Sylvia. If you're usually the life and soul of the party but end up being super quiet and only pipe up to say "please" and "thank you," their family is going to be left with a totally wrong impression of you. "Show them that you're charming, engaging, and care about making a good impression by asking questions to fuel conversation," Sylvia says. "Ask the parents where they grew up and how they met. These questions may seem generic, but they are great conversation starters that will help you get to know each other better." Don't stress about your outfit. There's no need to waste energy worrying about what to wear to meet the parents. As long as your outfit is event-appropriate (like, probably don't go to a black tie dinner in short shorts) then use it to express who you are. It's always best to dress like YOU and be fully comfortable. Everyone's family is different. Some love to get right into political debates and talk about current affairs. Others might tend to stick to less potentially controversial topics like awesome TV shows. As there's no hard and fast rule, just gauge the vibe and go with it. If they ask for your opinion on something, give it to them (respectfully of course). Keep your phone off the table. "Turn your phone off. Texting while socializing may pass for good company among your close friends, but checking your phone when meeting the parents is a definite no-no," Sylvia says. "All it says to your partner's family is that you don't value their company. Nothing screams 'Rude!' louder than your phone ringing during dinner." If you are really nervous, one of the best things you can do is offer to help out. It keeps you busy and shows you're a nice person with good manners, right? 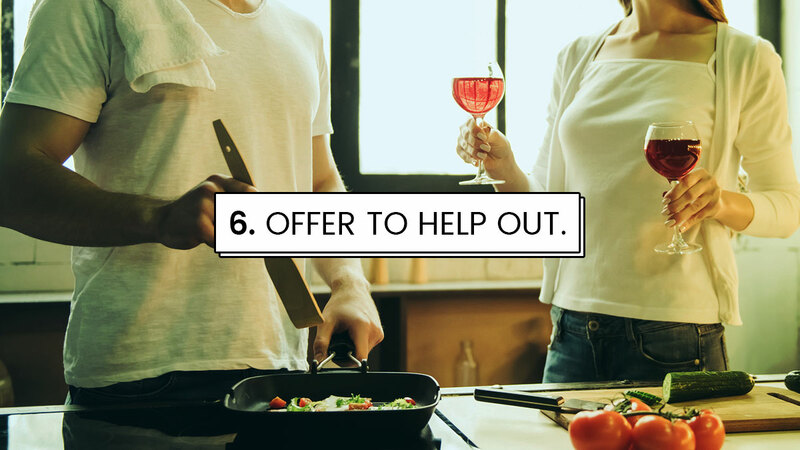 "Offering to clean up at the end of the night also gives your partner's family the chance to get to know you without them present. Be sincere about your offer to help out and just as respectful if the family declines your assistance," Sylvia adds. "Treat your first meeting like a first date. Be yourself. Just remember to be the polite, engaging version of yourself without being fake," she says. "You want your boyfriend’s parents to like you for you, not to the false person you're pretending to be at dinner. Families can sense when someone is faking interest and may view your excessive compliments as insincere."